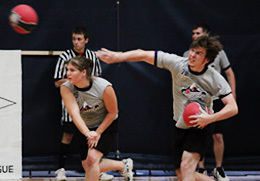 Below are some basic guidelines everyone MUST know to survive in the dodgeball trenches. These guidelines can be applied to any individual or team and will help you navigate your way through the local pickup games, leagues and tournaments. Never turn your back to your opponents. You may as well put a sign on your back that says "Hit me". On the rush, back away from the center line to give yourself a chance to block, dodge or catch. Too many times I've seen easy outs, as people turn around and run to their back-court or as someone is looking around for a ball. When on the sideline pass spare balls to your teammates in a non-distracting way that requires little focus on their part, such as placing them at their feet or slowly rolling them on the ground. Exception: When trying to bait an opponent to throw - useful when you're actually prepared to catch or trying to draw balls back in your favor through dodging. Know how many balls are in play and who has them. This will save you from getting picked off by the opponent hiding the ball behind their back outside of your peripheral vision. Additionally, if your team holds one ball you can still block or slow down an opponent attack by threatening a throw. Throw this ball away and you've lost two dimensions to your team defense. Throw low. Aim for knees or below. These throws are much more difficult to catch than those thrown between the knees and shoulders. This also reduces pop-ups which lead to second chance catches. Exceptions: Kneelers and Jumpers. Throw as a team. It's much harder to track, dodge, and catch two or three balls rather than one. Throwing as a team increases your chance for outs and decreases the chance of catches. An alternative is to have two or three people throw with one faking the throw and holding the ball instead. Protect your teammates. It's easy for tunnel vision and self-preservation to set in when the balls start flying. Remember that there are five (or more) teammates out there in which victory depends on. Protect Throwers from opponent fire through blocking, arm fakes or pointing to the right and shouting "Lady Gaga!" Catchers should pass balls to less skilled teammates, while Blockers and Dodgers should be forward to draw fire.